•	It heats or cools the house quickly compared to hydronic heating; this is because blast of cool or hot air is forced through the vents. •	They are cost effective. As you get the heating and cooling through a single duct work. •	No matter how efficient system you buy, a certain amount of leakage of air would happen trough the leaks and seams of the ducts. •	The fluctuation of temperature can be enormous in case of forced air systems. This will depend on the level of insulation of the house. As soon as you power on the system for cooling, chill air will get into the rooms bringing the room’s temperature down by degrees. As soon as it is off the temperature will again rise up soon. Moreover the level of cooling will not be same in all floors. In summer the basement may be 5 to 1o degrees lower than the finished attic. This is because cool air falls and warm air rises. The level of heating and cooling will also depend on the length of duct work or the distance of the room form the central unit. Longer ducts or too many bents inside the ducts will reduce air velocity and resultant cooling or heating of the room. •	You will often find cold spots in the rooms. This is because of uneven heating. Loss of air will be significant near the windows. Rooms with floor registers will find cold air concentrating at the bottom and warm air rising up. •	Forced air system brings in lots of dust, debris, pol lens, allergens, bacteria and mold along with air. They get inside the ducts through the leaks and joints of the ducts when they pass through unconditioned basements and crawlspaces. These can cause health problems by making indoor air polluted. •	Duct systems are also noisy. They conduct the sound of the HVAC. They can also bring the sound from the other parts of the building. Air passing through ducts also causes certain sound which intrudes sleep. •	Forced air system heats the air in winter and makes it hot and dry. This combines winter dryness, and makes you feel uncomfortable. The dry air dries your respiratory tract, results in itchy eyes and nose. It can cause breathing troubles as well skin diseases. •	Installing duct works is also expensive. They need additional spaces and may not be a good option in retrofit projects. •	You have to change the filters in forced air systems at regular intervals. Buying and changing filters is an added expense and a hassle. •	Forced air systems require more maintenance than radiant underfloor heating systems. 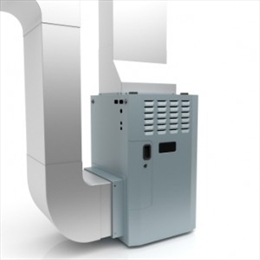 •	Forced air systems are controlled by one thermostat. Therefore it is difficult to maintain even temperature in all rooms.